The ancient diamond shaped country of India, the largest region of the Indian Subcontinent, extends from the Himalayan Mountains in the north and south into the tropical reaches of the Indian Ocean. With a population of 1,220,800,359 (2013 est), India is the most populous country in the world, and certainly one of the most intriguing. This diverse and fertile country, which once included the lands of today's Bangladesh and Pakistan, was plundered over eons of time. Its history begins some 500,000 years ago as early hominids graced the land, and from 3300 to 1300 BC the Indus River Valley Civilization flourished. The sophisticated and technologically advanced Mature Harappan period followed, lasting around 700 years before collapsing and giving rise to the Iron Age Vedic Civilization during the second millennium BC. India and much of Asia were conquered by Cyrus the Great of Persia in 530 BC and Alexander the Great in 326 BC. Together the Persian and Greek invasions left a lasting impression on Indian civilization, with the Persian's influencing future forms of government. The Mauryan dynasty rose to power in 322 BC, and flourished under the leadership of Ashoka the Great - becoming one of the most powerful political and military empires in ancient India. 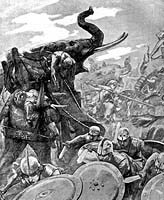 A succession of weaker kings followed, which contributed to the rapid downfall of the Mauryan dynasty, and by 185 BC the Mauryan dynasty had completely dissolved. 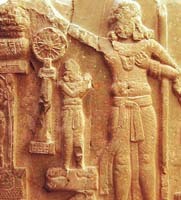 India's "Classical Age" began around the 7th century AD with the Gupta Empire. It was during this time frame that development of India's main spiritual and philosophical systems in Hinduism, Buddhism, and Jainism continued. The Gurjara Pratiharas of Malwa, Eastern Ganga dynasty of Orissa, Rashtrakutas of the Deccan, and the Palas of Bengal all fought for control of northern India between the 7th and 9th centuries. But it was the Sena dynasty who prevailed, and assumed control of the Pala Empire, dividing the Gurjara Pratiharas into various states. These states were the first of the Rajput, who became an array of kingdoms managing to exist in some form or another for nearly a millennium.